It has an extra layer of protection with the Titan security chip so your information, device passwords and OS are protected on your device. It is powered by 8th Gen Intel Core m3, i5 or i7 processor, or Intel Celeron processor, up to 16GB of RAM, up to 256 GB storage, and 8MP cameras on both the rear and front, and the front-facing Duo Cam provides an extra wide field of view. 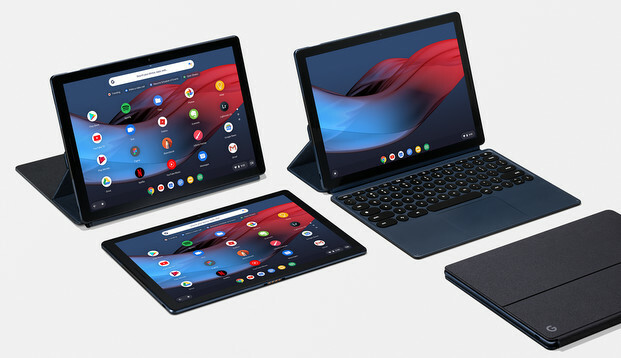 The power button doubles as a fingerprint sensor and the Pixel Slate promises up to 12 hours of battery life with typical mixed usage.Pixel Slate Keyboard has round Hush Keys, dedicated Google Assistant key and an extra large trackpad.